Compilations of previous studies provide researchers with a source of valuable secondary data for re-analysis, an access route to identify relevant literature and an opportunity to systematically evaluate the research which is conducted and published. Recently Suggitt et al. (2015 Veg Hist Archbot 24, 743–747) presented a valuable compilation of core records for England. Here we present an extended version of this English Sediment Core Meta-database which includes data for 100 additional cores and improves the consistency of presentation. Despite these additions there are clearly large gaps remaining. Maximising the value of such meta-databases requires a community effort and we hope that this contribution will be a first step towards achieving this. Compilations of metadata for previous studies can provide a number of important benefits to Quaternary scientists. Such meta-databases can be an effective way for researchers to identify relevant previous research and can provide a basis for secondary re-analysis of published datasets. Building such compilations also provides a useful opportunity to evaluate the ‘state of the art’ and assess trends, biases and gaps in the research which is undertaken and published. Previous databases covering the United Kingdom have focussed on specific environments such as lakes (Battarbee et al. 2011) or peatlands (Payne et al. 2016) or on specific methods such as pollen analysis (Fyfe et al. 2009) or tephra (Newton et al. 2007). Recently Suggitt et al. (2015a) presented an English Sediment Core Meta-database (ESCM) with the goal to ‘determine as many sediment coring sites in England as possible’ with a particular focus on the Holocene. This is an ambitious aim given the range of sedimentary archives and proxies encompassed and the quantity of research conducted in England over the last 100+ years. 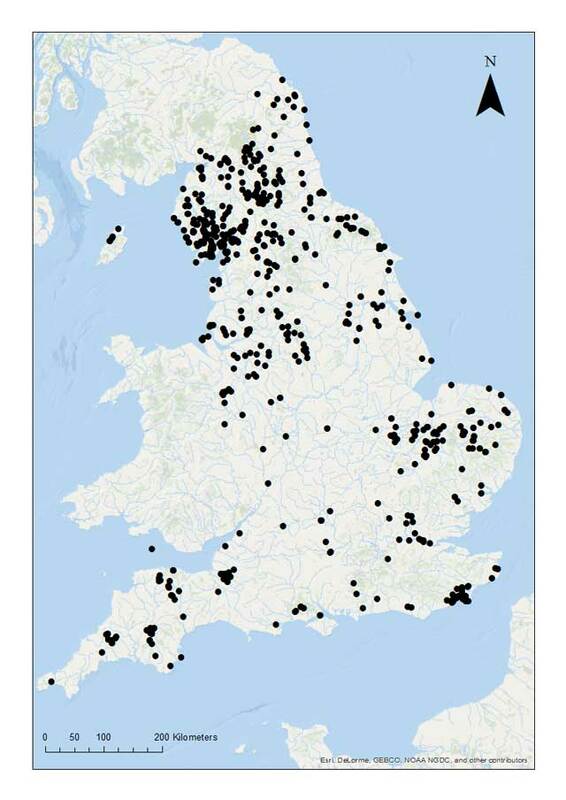 The resulting dataset, presented in supplementary material to the published paper, includes records for 763 locations and is a valuable tool for anyone interested in the late-Quaternary development of the English landscape. The scope of this compilation is very broad and the authors acknowledge that the resulting dataset is by no means exhaustive. Inevitably there are gaps in any such study and Tooley (2015) highlighted some data missing from the original paper. However, as noted by (Suggitt et al. 2015b), not all of these studies may have met the original inclusion criteria. It is clear that there is more to be done and that the potential applications of the dataset will be maximised if it is as comprehensive as possible. Despite their value, substantive funding is rarely available for the assembly and maintenance of databases of this type. The Suggitt et al. (2015a) study was financed on a one-off basis by Natural England, and there is no funding for this to be further developed or updated with new research. The best possibility to maximise the value of the dataset is therefore for it to become a wider community project with contributions from other researchers as and when possible. Firstly, to the published dataset we added data previously compiled by Payne et al. (2016) for peatland sites across Britain. This study identified 475 radiocarbon dated peatland sites of which 186 are in England. To be included the sites were required to have dates and sediment which could be confidently considered peat and the studies were required to have been published since 1970. We carefully cross-checked this dataset against the ESCM data and identified studies not included in the published dataset. Secondly, to identify more recent papers we conducted new searches of the journal databases Google Scholar and Web of Science for search terms used in the original paper focussing on papers published since 2014. Thirdly, we conducted additional searches using a variety of search terms not included in the original papers. Finally, we added any other papers of which we were personally aware which were not otherwise included. Add missing detail to the site entries when possible. Add missing information to the references and endeavour to improve the consistency of reference formatting wherever possible to make it easier for readers to identify the source material. Correct some minor errors which we noted in passing. We also removed some entries which were highlighted as duplicates by a reviewer of this manuscript. Remove columns which we find not to be helpful to the general user or which appear to be inconsistently or infrequently recorded, namely those headed: ID, Full/partial dataset, Title, Search terms, Search facility and Provenance (AJS/ZT). Our amendments both add a substantive body of new data and improve the consistency of presentation. However, with a task of this magnitude it is inevitable that there will be both omissions and most likely some errors. The database is clearly imperfect and biased in many ways and some of these may have been reinforced by the additions made here. The database is a work-in-progress. Extended English Sediment Core Meta-database.xls. The dataset published here reflects the work of both the authors of this paper and that of the original publication (Suggitt et al. 2015a) which should remain the primary reference for anyone using this database. We identified 100 site records not previously included in the ESCM dataset, representing an increase in the overall size of the database of 13% and bringing the total number of records represented to 849 after deletions. Given our own expertise a majority of these (~60%) are for peatland sites. Our additional data tend to reinforce the conclusions of Suggitt et al. (2015a) regarding the nature of the research conducted. The majority of our new records are from northern England (Figure 1), the majority are studies based solely or largely on pollen and the vast majority are for the Holocene, particularly the mid-to-late Holocene. Additions included some quite highly-cited papers which were previously not included (Barber et al. 1994; Hendon et al. 2001; Mauquoy and Barber 2002). It should be cautioned that the lack of representation of studies in the database does not necessarily imply that studies have not been conducted; it may simply be the case that these have not been identified. Both the original database and our extended version have considerable biases, for instance, papers on coastal environments and the archaeological literature are clearly under-represented while freshwater peats are now quite well-represented. This bias may, for instance, mean that the impression that comparatively little research has been conducted in central England is misplaced. Sites included in the extended English Sediment Core Meta-database. Minimising these biases requires contributions from researchers with a range of expertise from across Quaternary Science. Data sources such as radiocarbon date lists and databases, the Archaeological Data Service, thesis repositories and the institutional data holdings of organisations such as English Heritage and the British Geological Survey would doubtless reveal a wealth of further data which would reward investigation. Without any direct funding we propose that the best way to continue to build and extend this database is by individual members of the Quaternary Science community contributing data within their own areas of expertise. Data papers in this journal might be a useful way to facilitate this process although issues of consistency and quality control will require attention. We hope this may be the first of many such contributions bringing together knowledge from the research community to extend and refine this valuable database. We thank the inter-library loans staff at the J.B. Morrell University Library in York and the University of Stirling Library for their assistance tracking-down many obscure publications. Suggitt, A J Jones, R T Caseldine, C J Huntley, B Stewart, J R Brooks, S J Larwood, J et al. (2015a). A meta-database of Holocene sediment cores for England. Vegetation History and Archaeobotany 24: 743–747.